Ristorante Pizzeria Romanella @Wolfsgangstrasse (Frankfurt a. M., Germany) | Get Your Grub On! After a lovely weekend with my family I drove up to Frankfurt for a meeting the next day. There was an Italian restaurant on the other side of the road so to keep my evening hassle free I just made my way over there and sat down outside in this beautiful weather. At the beginning I was one of two tables but before I finished my dinner the place was packed. They had a special menu with a lot of seasonal dishes under which some came with chanterelles as the main ingredient. 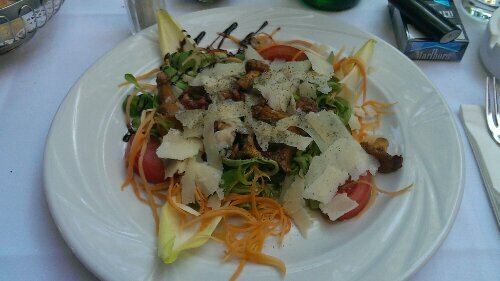 As I didn’t have those for a few years now I started off with a ‘Salat mit Pfifferlingen‘ (salad with chanterelles) which came as a big plate full of fresh greens, drizzled with a balsamic reduction and covered with nicely salty parmesan shavings. I loved the warm center of pan fried chanterelles, bacon and onions but there was too much oil on it that made me feel a little greasy towards the end. 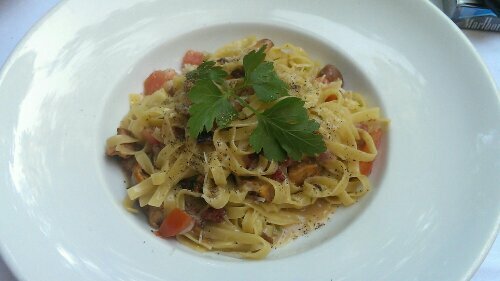 To stick to the theme I made the ‘Tagliatelle mit Pfifferlingen‘ (tagliatelle pasta with chanterelles) my main. The dish was light and tasted awesome and my fear it would be as oily as the salad didn’t come true. The handmade pasta had a distinct eggy flavor and was on the spot al dente, covered with a thin creamy layer of oil and juices. The chanterelles tasted great and wonderful mushroomy, not like the stuff I’m used to from the supermarket in Singapore. Some cracked black pepper over all of that and I left smiling into my Sunday evening. Great food, friendly staff, lovely ristorante in a quiet part of town. Nice.